In 2017, a world received a new product for a live casinos segment of industry of gambling. Evolution Gaming company represented a wheel of fortune named Dream Catcher Lucky Wheel. 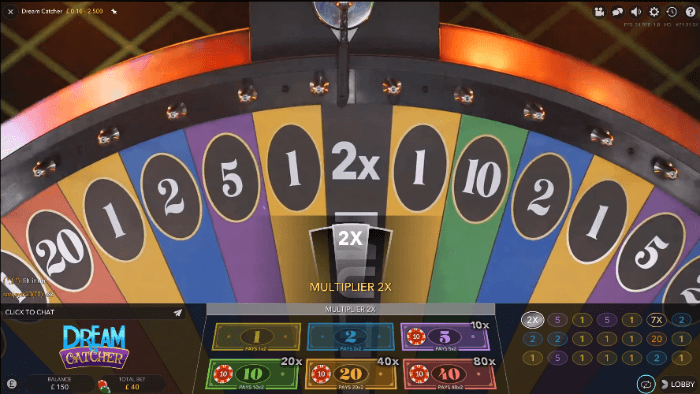 The game has a mesmerizing size of the vertical wheel with gold and silver multipliers: x7 & x2 accordingly. The gamblers are allowed to do the repeated bets for the chosen amount of rounds of the game using the auto-spin function. A Dream Catcher’s wheel is divided into the same-sized sectors for bets with 6 various numbers of the unique color for each. Sectors with 1 are highlighted by the yellow color. Sectors 2 are blue, sectors 5 are violet, 10 are green, 20 are orange and finally, 40 are red. If your bet is USD 100 on number 1 and the sector coincides with your bet, you get the bet + the multiplier, which is x2, totally receiving USD 200. When making a bet of USD 100 on number 2, you may receive 100 x 2 + 100 = USD 300. If you will have these sectors, you will not have an immediate win but an increased chance to win 2 or 7 times more in the next spin. In order to catch x40 in the x7 regime, you have to hit eventually 1 to 108, so it means the 0.9% probability of a chance of such event. When we play the classic roulette, we lose 2.78% per game with 37 numbers on the wheel including zero. Hitting one number brings you multiplication of your bet at 36. The Dream Catcher has 54 positions, 6 numbers and 2 bonus positions. It means that the bonus modes x2 and x7 make the dispersion & the distance bigger. Number 20 and Number 40, it’ll be a roulette game in chances to win, i.e. 1 to 36 and 1 to 75. Number 2 – you win in 25% of the cases but the winning gives you x3 of the bet – making thus the scheme close to zero in total winnings. This game has pretty optimal working characteristics for mobile platforms with not large screens & tablets. Choose a type of a picture you desire & get ready to roll the wheel of fortune. The game is optimized using HTML 5 to make the functionality the best. You’re able to play this game directly in your browser using a secured channel with the gambling house.